Innovative therapeutic techniques for achieving person-centered results. Lifeworks Music Therapy identifies skills and interests while increasing abilities, health, and wellness. Lifeworks Music Therapy can benefit children as well as adults, and is provided by a board-certified music therapist at the Apple Valley, Brooklyn Park, and Eagan Lifeworks locations. Music Therapy is available in group and individual settings. Lifeworks uses proven and cutting-edge techniques to customize the best therapeutic experience for each individual. Goals and objectives are individually determined and continuously assessed. Communication devices, assistive technology, and sensory tools can be incorporated into music therapy sessions. Sean is a board-certified music therapist who graduated from Augsburg College in 2016 with a double-bachelor’s degree in music therapy and psychology. He was born and raised in Minnesota and enjoys living in his home-state, especially in the summer months, however brief. Since becoming board-certified, he has worked almost exclusively with adults with developmental disabilities. 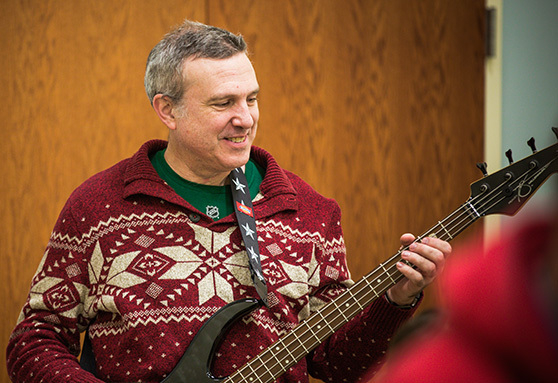 Sean’s music-centered approach was fostered during his clinical internship in music therapy and provides an opportunity for the music to speak first, while addressing the non-musical goals of the client through musical means. His primary instrument is the guitar, while he also enjoys singing, playing the keyboard, drum set, and electric bass. He works with clients in 1:1 or small group settings, although he prefers deep connections made during his time in 1:1 sessions. Laura is a board-certified music therapist who received her degree in music therapy from Augsburg College in 2012. She is originally from Iowa, but is very happy to have settled down in the Twin Cities after a few years living in Texas. Laura has experience working with a wide variety of populations, but really enjoys working with children and adults of varying abilities. She has worked extensively with people who have Down Syndrome, Autism, Fetal Alcohol Syndrome, and other developmental and cognitive disabilities. She is comfortable leading both individual sessions as well as groups. Laura loves using the guitar, piano, voice, percussion, and the cello during music therapy sessions. She is also bilingual, having learned Spanish while living and working in Central America. Lifeworks is excited to offer a National Roster Music Therapy Internship experience for students completing their undergraduate degree in music therapy.